Boylesports has launched a new financial binary betting offering following a partnership with binary option platform provider Tradologic. So, as of today anyone wanting to have a bet online now has the option of “financial” next to the standard options of sports betting, poker and casino. Boylesports have integrated a range of TRADOLOGIC’s financial widgets into their new portal to allow customers to access the new product. 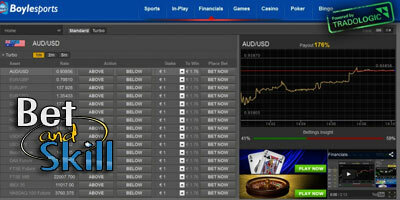 The new system will allow Boylesports customers to bet/hedge on a variety of binary options throughout various financial markets. Currently, TRADOLOGIC offers its clients a variety of products including option types, binary options trading tools, advanced features, integration solutions and services that deliver unique trading experience and optimized user value.